Q. How do I set up an appointment to get into your program? The first step is to contact our intake department at (513) 386-4735 (Cassie) or (513) 405-1183 (Jan). We receive a high volume of calls, so it is possible you might be sent to voicemail. If this happens, please speak clearly and slowly and leave your name and a good contact phone number or numbers where we can reach you. We will call you back! Q. Do you take Medicaid / private insurance? Yes! Adams Recovery Center (ARC) takes Medicaid and most private insurance. Please contact us to determine if your insurance qualifies. We also accept private pay. Q. I want to come in as soon as possible for an assessment. How long is the wait? Adams Recovery Center prides itself having several qualified licensed staff who can provide an assessment, sometimes the same day you make contact. We provide assessments daily for both in-patient and intensive outpatient. Please contact us to speak with our intake department to schedule an assessment. Q. I’m not sure what type of treatment I need. What do I do? Adams Recovery Center will assist you during the assessment process to help you determine what level of service you require and ensure you are matched with the correct program. Our trained professionals will help you make the most informed choice to begin your journey towards sustained sobriety. Q. Will I be admitted the same day I am assessed? The first step in determining eligibility for the program is to speak with our intake department. We will review your intake, and, if eligible, you will be given an assessment day and time. When you are assessed by one of our competent team members, we will inform you if any of our program offerings will be a good fit for you. All admission determinations will be made pending the final outcome of the assessment. Please note: If you are not appropriate for our program, we will make referrals for you. Please note: Although we do ask you to bring your belongings with you, it is not guaranteed you will be admitted at that time. However, please bring your belongings in any event! Q. What if I have a co-occurring mental health disorder? Will I be allowed in the program? Each individual is assessed based on her or his needs. 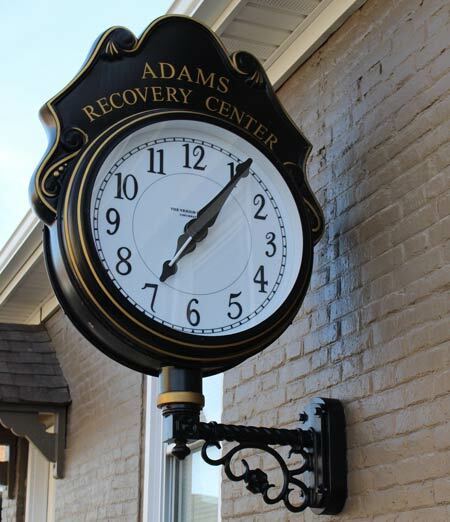 Depending on the severity of the mental/emotional health needs, most clients are able to enter Adams Recovery Center. Your assessment counselor will discuss your needs with you and help you determine the right choice. Q. Is Adams Recovery Center just another 12-Step program? No! Adams Recovery Center does provide voluntary sober support meetings (open to both clients and the community), held on a daily basis in our facility. However, the foundation of Adams Recovery Center’s clinical program is evidenced-based cognitive-behavior and rational-emotive behavior modality (Hazelden) blended with the Therapeutic Community model. Adams Recovery Center offers individual and group counseling with individualized service planning tailored for your needs, as “one-treatement-plan-fits-all” approaches do not work. Q. What is a Therapeutic Community? This is a community based off accountability, respect and dedication to sustained sobriety. In a program based off community, we set a schedule of five hours per day of group counseling. Q. Will I receive individual counseling? Yes, our program individualizes each client’s programming. You will receive individual counseling once per week. Q. Is there a daily schedule? Yes, there is a scheduled routine per day of group counseling, sober support meetings, chores and free time. We highly encourage structure in day-to-day activities. Q. How long is the residential treatment program? We encourage new clients to plan between 90- and 180-day programming at Adams Recovery Center. The length of time you spend in treatment is determined by your progress and your needs. Everyone’s length of stay will vary. It is important to remember and worth repeating: Your length of stay in our program will be determined by your clinical needs. If you are unwilling to stay for the projected duration of your treatment, we will need to discuss other options with you. Q. Are you a locked facility? Adams Recovery Center is an at-will facility. Anyone who is a resident in our program is able to freely leave at any time they wish. We encourage all residents to remain in treatment and to make positive changes in their lives. Q. How long is the daily treatment with recovery program? We encourage new clients to plan between ninety (90) and one-hundred and eighty (180) day programming at Adams Recovery Center. The length of time you spend in treatment is determined by your progress and your needs. Everyone’s length of stay will vary. Q. Am I permitted to leave the premises? Clients are permitted to make and keep appointments coordinated with their counselor and medical staff. Adams Recovery Center offers five hours of treatment per day, in addition to individual counseling sessions. Treatment should always, of course, come first, and as treatment is a priority, Adams Recovery Center’s program would not permit for residential clients to secure/maintain employment. Yes, breakfast is continental-style. Lunch and dinner are catered by Heritage Hall Banquet and Catering Services. No, the women’s facility is located at 1569 State Route 28, Loveland, OH, 45140. The men’s facility is at 1050 U.S. Highway 52, New Richmond, OH 45147. Q. What should I bring if I plan to come into the daily treatment with recovery program? For a complete list of dos and don’ts for the men’s center, click here. For a complete list of dos and don’ts for the women’s center, click here. Q. What are some items I cannot bring with me? Q. Can I smoke at Adams Recovery Center? Generally speaking, you may smoke outside during designated times. However, there are some restrictions placed on some individuals who might have a medical condition whereby smoking would be contraindicated. You will speak with medical staff at Adams Recovery Center if there are any medical conditions with which smoking could complicate issues. Q. Am I allowed to communicate with my family? Absolutely. The program permits two ten-minute phone calls per week under supervision. Q. What about family visitation? Yes, we have visitation on Saturdays. There is a group session from 9 a.m. to noon, followed by visiting from 12:30 p.m.-2:45 p.m. Family is required to attend the group to have visitation. Q. What about home visits? Home passes are offered in programming. These are individualized and usually occur somewhere between 75-90 days in the program to reacquaint individuals into their community before discharge. Q. Am I permitted to bring all of my medications? If you have questions about a specific medication, please contact us to discuss your current needs. Q. What about Suboxone and Vivitrol? We will assist you in finding a local provider.